"Breathing in, I calm body and mind. I know this is the only moment." One of the biggest secrets to happiness and success in life is right in front of everyone, yet largely unseen. It has to do with the way that most of us are either our own worst enemies or our own best friends—based on what is going on inside our minds. Life can feel bright and beautiful, or it can feel miserable, and our thoughts and feelings have a great deal to do with which we experience. Fairly or unfairly, providence tends to smile more favorably upon those who smiling, too—so the benefits are huge when we learn the art of getting back into a more joyful state of being. According to the Laboratory of Neuro Imaging at USC, the average person has 70,000 thoughts per day. If those thoughts were airplanes, that amount of daily traffic is many times greater than what is handled by the world’s busiest airports. Busy airports require air traffic control to maintain order and help prevent crashes, so thought traffic control could make a whole lot of difference with our 70,000 thoughts per day zipping around our minds. How can we learn to direct all of our thought traffic, especially when many of our thoughts are negative? Let’s break the problem down to just one thought at a time—or one vehicle at a time. Since most of us are more familiar with driving cars than airplanes, let’s envision the process of shifting mental gears as being analogous to shifting gears on a manual transmission car. When shifting gears in a car, we must first disengage from one gear before moving through neutral, and then re-engaging in the new gear. We can engage a similar gear-switching process in which we go through neutral between gears every time we move our consciousness through a state of disengaging from current reality–such as we feel when dreaming, daydreaming, meditating or praying. You can reduce stress in daily your life through learning three simple activities that can help you shift mental gears utilizing mind-body-spirit mindfulness: take a few minutes each day for meditation; pay attention to breathing deep, full breaths; and take time to slow down and enjoy a present moment experience in Nature. Breathing and meditation can be done anywhere you go in any environment, and finding bits of Nature to enjoy can be easier than you might think. Studies show that people who look out a window to see trees and greenery benefit from reduction in stress hormones, as do people who take time to enjoy the presence of houseplants in their homes and offices. These three simple activities are powerfully transformative, thanks to the way they assist us in detaching from fixating our attention on annoyances, frustrations, and what seems to not be going well. Next time you feel your mind is racing, remember to slow down, take some deep, full breaths, and see if you can find any natural greenery nearby to enjoy. Become aware of your true self being the observer of all those tens of thousands of thoughts you think each day—rather than their servant. You can watch thoughts come and go, much the same way an air traffic controller watches airplanes land and take off. Such awareness of being at one with your mind, body, and spirit can provide you with fresh reserves of energy, enthusiasm and inspiration just when you need it most! 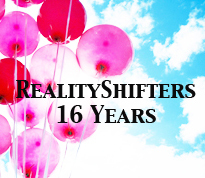 I am truly grateful that RealityShifters is celebrating its 16th anniversary this year. 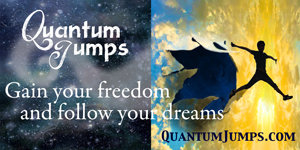 I have loved collaborating with many wonderful authors, scientists, and researchers in the fields of consciousness and quantum physics. 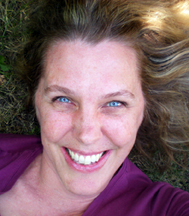 I adore working with so many wonderful clients who schedule life coaching sessions with me. I love the emails and social media comments and questions I receive every month, and I especially love meeting people in person when I give talks about quantum consciousness. 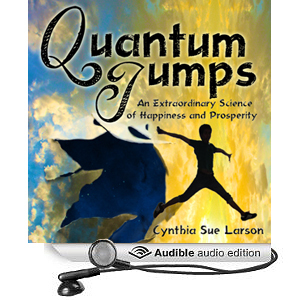 I am also deeply grateful that I now have three of my best-selling books in audiobook form, including: Quantum Jumps: An Extraordinary Science of Happiness and Prosperity, Reality Shifts: When Consciousness Changes the Physical World, and RealityShifters Guide to High Energy Money. 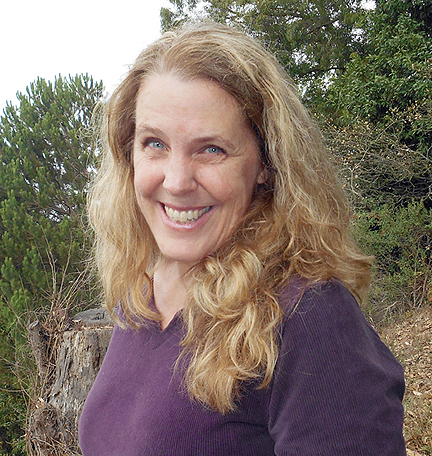 UC Berkeley alumna Cynthia Sue Larson presents a radical new paradigm: that we exist in an interconnected holographic multiverse in which we literally jump from one parallel universe to another. This talk will explore recent studies in psychology, biology, and physics showing how natural systems show clear signs of preferring quantum methods for such processes as: photosynthesis, avian navigation, and olfaction (our sense of smell). The implication of this growing body of interdisciplinary research suggests that consciousness is pervasive and primary in influencing events in ways we are just beginning to comprehend. All UC Berkeley students and community members are welcome to attend this talk. The format will be a one-hour talk, followed by a Q&A session and then informal discussion. 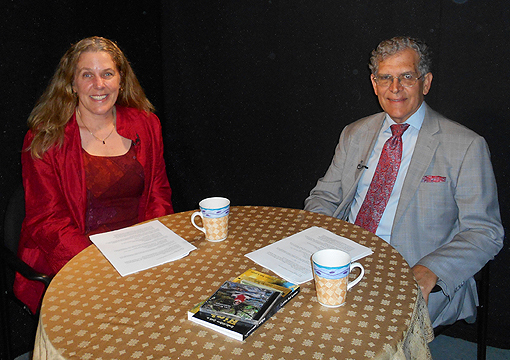 Cynthia Sue Larson talks with Michael Gray about how we can better manage emotions when making financial decisions. A recent survey conducted by the American Psychological Association indicates as many as 8 in 10 Americans report feeling stressed about money concerns. Is there something people can be doing to better manage stress, and how can we utilize the top tips from the mindfulness revolution? Find out in this fun, informative show! While every one of us has one, few people give much thought to their energy body. Also known as the aura, these shining bodies of light have been recognized for millennia to exist in all living things. Since dark or damaged auras are early warning indicators of every kind of physical, emotional, and psychological problem, it is clear that you can improve your health by taking one day each year to examine your aura. November 23, 2013 will mark the twelfth annual International Aura Awareness Day. Visit the event page to find out fun ways you can join in the fun! Integrating our mind, body, and senses reacquaints us with direct experience and brings us amazing perceptual acuity. We can heighten our sensory awareness to levels most of us aren’t aware is possible. Certain tribes in Africa and South America can identify the position of Venus in daytime. A few hundred years ago, many sailors used Venus to navigate by whenever it was above the horizon, even during the day. Most people today would need some kind of shading or viewing tool to block the sunshine in order to find Venus in daylight, if they were even willing to attempt such a task. Hyperacuity is our innate ability to feel heightened sensitivity to environmental stimuli. Researcher Eugene Marais showed that people under hypnosis can recognize differences between apparently identical pieces of blank paper, using minute differences such as small marks, creases, irregularities, and the position of the watermark, which would otherwise go unnoticed. Marais showed in a 1922 study how a hypnotized subject could easily distinguish between twenty apparently identical snail shells, or determine who had handled certain objects by a sense of smell alone. He devised similar experiments to show that humans have an amazing sense of direction, and this finding suggests that the homing instinct and sense of direction of animals is a natural facility that humans often suppress. While humans may have developed intellect at the expense of sensory ability, we can recover sensory acuity. Some researchers document extraordinary cases of transposition of the senses, such as the cases Cesare Lombroso cited (1836-1909) of seeing through the skin of the ear and nose, and smelling through the chin and heel. I spent a lot of the day stressing out about my car, which was at the mechanics getting checked out. I watched several of your videos, which helped me to relax and center. I calmly thought about the outcome I wanted, and even did some muscle testing which verified that what was going to happen. Just got off the phone with the shop, and it's indeed not as bad as feared (which would have been a new transmission at 3 to 4 grand!) Thanks so much for the work you do! Note from Cynthia: Thank you so much for writing to me with such wonderful news about how you moved out of feeling stressed into feeling calm and positive. How marvelous that you've heard good news about your car, and thank you so much for letting me know! This is my second time writing to you. I must admit I have had a lot of quirky things happen in my life and this certainly is one of them. I wrote to you some time ago about the changing sandals in Mexico and your explanation really made sense. Last year I went to a resort with my sister. Strange how these things happen when I am more relaxed. Any way there was a fellow there who was employed as part of the wellness program. He was well educated as I remember from his bio on the brochure. He offered private sessions to help with stress and life events as well as advise on nutrition and diet. On the second last day of our vacation my sister and I were taking in some sun on the beach. I decided to go to the juice bar and grab us some smoothies. I immediately recognized that fellow was there as well. Actually he was just leaving with his drink but said hello to me. I got a very good initial look at his eyes because we were up close at eye level as we spoke and since it was a shaded area I had already taken off my sunglasses.We got into a brief conversation about different diets. I told him I had reintroduced meat into my diet because my iron levels were on the low side. 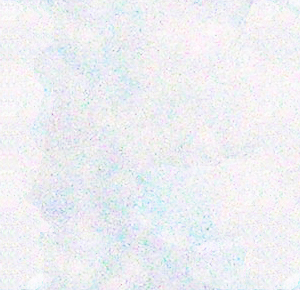 He said "I am a vegetarian, but every once in a while my skin gets scaly, so I eat some meat.” Just as those words left his mouth and before I had a chance to comprehend his rather strange statement, I recalled wondering how it was that I had not noticed how the whites of his eyes were pure concentrated YELLOW. I remember at that moment feeling sorry for him, because the only explanation I could think of was that he had hepatitis, or some other liver condition. Suddenly his pupils were no longer round and human-looking, but were slits like reptilian lizard eyes. Those slits were like a dark green colour. I recall thinking exactly that! And then realizing he had just said his "skin gets scaly,” so he eats some meat. Within the next second his eyes changed back to how they looked when we first started talking. The whites of his eyes were WHITE and his pupils were ROUND! I saw that his brown eyes were back as well. As I stood there staring at him realizing I did not hear what else he said prior to very politely excusing himself, saying he had an appointment, and with that he left. I headed back to my lounge with the drinks, feeling rather numb. Strangely I was not frightened. It all happened so quickly and felt matter of fact, that there was no room for any reaction. Eventually I told my sister about the experience. We loved that resort and had gone two years in a row. This year however, I chose another spot! Note from Cynthia: Wow, now that really does sound like a wild experience! I once did a staring meditation where I looked into a friend's eyes, and he looked into my eyes, and we each saw many faces dancing around the eyes--kind of like gazing into a whole series of past lives with faces of different races, ages, genders and characteristics. But it sounds like what you observed was nothing like this kind of staring exercise, if I understand you correctly. This sounds like just a normal conversation with a normal person--who suddenly doesn't seem very normal at all! And how odd that you recall him saying something about his "skin gets scaly"--good heavens! Just had to write to tell you that I am enjoying Quantum Jumps immensely, and had my own little experience this morning. I lost my wedding ring over six weeks ago, and I accepted it and gave up on finding it. Yesterday morning I put on a different ring to fill in the void, and thought "I wish I had my ring back." This morning I walked into my daughter’s room and glanced down at the floor near her bookshelf where a pink hairband lay all week (I know this because I looked at it many times) and there was my ring! I was overjoyed. Note from Cynthia: How wonderful to find your missing wedding ring in a place one wouldn't normally expect to find it--and I also surmise you probably would have seen it near the hairband on the floor, since it sounds like you've seen the hairband there on more than one occasion this past week! Yes, this is an excellent example of quantum jumps and reality shifts, and they really can happen in an instant. I was walking my dog in the morning... he went to the bathroom and I picked it up with a bag. We walked a little further and he went again and I did the same thing. Since I wasn't going to walk down the street with 2 doodie bags I decided to throw them on the ground and I would pick them up on the way back. A woman was standing across the street by the curb waiting for her friend to pick her up, I joked with her about waiting and I was concerned that she might think I was littering in the neighborhood. My dog and I walked only 1-2 houses further and turned around. I decided to do some manifestation work and I started singing about how I was moving and got this job of my dreams and was going to get ready to leave my current location. I was almost home when I realized that I had forgot the doodie bags and I wondered why I didn't notice them walking back since I had walked on the same side of the road and there was two of them (not hard to miss). I walked back to where I had dropped them and they were gone. I walked back further and back again but they were no where to be found. There was too much "stuff" in there too for them to be blown away. I recalled that only two cars had passed me -- one black suburban which was weird and caught my eye, going slow down the road -- and the lady who was picking up that woman who I had said HI to. It's highly unlikely that either of those cars stopped to pick up the bags. So that's it. Time shift. Pretty sure :) They disappeared just like that. Unless you can explain that incident with another plausible scenario, such as someone stopping and picking up what they saw to be litter and carrying it away--once all other typical explanations are ruled out, what you experienced is a reality shift. And I am fascinated that whereas back in the late 1990's people would not have said, "... just a general reality shift," nowadays people really do seem much more relaxed and matter-of-fact about these sorts of things happening from time to time. Every now and then, things do appear, disappear, transform and transport. I have been reading your book on Reality Shifting and I greatly enjoy it so far and I'm sure I will continue to enjoy it. It's so insightful and meditating has been doing wonders for my mood (keeping positive and being appreciative). I'm actually starting to think about exactly what I want in life then mediate use your techniques to shift my life into bringing the most enjoying and ideal things into my life. One of the things I'm mediating on is to not stress so much about my flaws. I am always nit-picking on how I look. I can't seem to get over certain 'flaws' I have and it's continuously on my mind. I have read that medical miracles have been done through mediation and reality shifting. I was wondering, though this might sound shallow and vain, but it there a possibility of meditating acne away? I know this is a minor flaw to have but as someone who has had problematic skin for years (puberty onwards) my skin is something I'm very insecure about. It has gotten way better over the years through changing my diet (whole foods, veggies, organic/all natural quality etc.,) and keeping up with a very nice organic skin care regime... but still I my skin is....less than what I would like it to be. Again I have been meditating and it has helped me not be so crippled over worrying about my flaws but it's still a bit of an issue for me. I wasn't sure if there was a way to target my meditation to rid myself of my acne and blotchy skin? Meditating has made me feel more connected to my body but is there a way to use this new found connection to encourage my skin to be a bit more nicer to my wants..like no more acne? I'm just not sure how I would guide myself through mediate for physical change. Again I apologize if this is a very shallow question but it's something I have thought on for a while. Thank you so much for writing to me with this question! This is the kind of question that lots of people are concerned with, and concerning a matter that can strongly influence the quality of peoples' lives, so I don't consider it trivial, shallow, or unimportant at all. Yes, I am confidant that you can experience positive results from meditating with a clear sense of seeing yourself with healthy skin, knowing that somehow such a future is not just possible for you, but where you're heading. I'd recommend rather than considering details of how this might come to be, simply relax and feel positive while envisioning yourself with healthy, clear skin. Meditating helps you become detached as is necessary for you to reengage with a reality in keeping with this wonderful future, and having a sense of faith in a larger conscious awareness that has access to all possibilities can be helpful as well. When you come out each of these meditations, make sure you do something loving and caring for your skin, and stay alert for new information that will come to you that may assist you in assuring this visualized positive future comes true. Thank you so much for your brilliant,comforting invigorating and fantastic catalogue of work!! I am writing to ask you if your books come in audio format? as I am a bit dyslexic ,and I really like audio books,as I tend to fully complete them when in that format! If the do could you let me know where I can purchase all of them. I would be very grateful for a favourable reply. Thanking you in anticipation! Past life regressionist Jonni Gray writes with heartfelt honesty about the powerful soul connection she felt with her only son, Connor before, during, and after his death in "Conduit." The idea of outliving one's child borders on unthinkable, yet many parents face such shocking realities. What made Connor's death especially hard for Jonni was that he provided irreplaceable inspiration, enthusiasm, creativity, love, and zest for life everywhere they went--and they had shared so much in the 22 years of Connor's life. 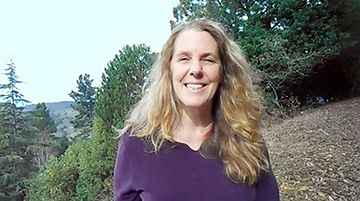 What I love most about "Conduit" is how Jonni's ability to tune in to energetic conscious vibrations and sense and feel the signature and essence of her son, Connor, provides her with remarkable insights that transform her view of love, relationships, and life purpose. Jonni asks herself "Why?" regarding Connor's death from being hit by a car. Through tuning into and channeling answers from spirit, Jonni recognizes the tremendous significance Connor had in her life, and the many ways his spirit has accompanied her through every stage in her life. With 20:20 hindsight, Jonni sees that she gained a new kind of courage and confidence in herself after giving birth to Connor, feeling a kind of twin soul connection with him. Theirs was a relationship of trust and respect that did not fit neatly into expected roles of mothers and sons, as both took turns encouraging and inspiring the other to set and achieve goals harmoniously attuned to their life purpose. Connor expressed a rare old-soul sense of attuned awareness of subtle energies and deeper truth, to the point that he was recognized by many as being an "old soul." Thanks to Connor's insights, Jonni made choices about where and when to move, how to do the kind of work she truly loves, and how to take vacations. Connor created meditation music used for Jonni's work, and regularly said and did things demonstrating wisdom far beyond his years. There is a way to view the significance of anyone's life far beyond the mere physicality of it, and this way invites us to see ourselves as much more than physical selves with human names and aging bodies. From such a spiritual vantage point, love is eternal, and connections of love provide us with all sense of meaning, love and purpose in our lives. As Jonni describes how Connor's transition from life into expansive being-ness was so painful for her human self to feel, she also describes the immeasurable joy of knowing for sure that her love with Connor is ever-present and eternal. From this viewpoint, Connor can still be felt as an encouraging, loving presence, and in that very real sense, he is still here. I cried tears of expansive love by the time I read the last few pages of this book, remembering how much I love and miss people who've been soul family to me. There is a feeling one gets from the presence of some people in our lives. This sense of presence is something almost tangible, with the ability to confer a sense of joyfulness, clarity, confidence, inspiration, hope and love at times when such feelings would otherwise not be present. I've been blessed in my life to have known and loved people who so embodied love in their thoughts, words, and actions that I still consider them in present tense in my life, due to my need for and awareness of their continuing connection with me. Conduit contains priceless insights for anyone who's lost a loved one they can't live without, providing us with a clear sense of the way such irreplaceable members of our soul family expand into fuller, bigger 2.0 versions of themselves. Highly recommended! At this time when a fuller understanding of consciousness is required in the fields of quantum physics, linguistics, psychology, computer science, and neuroscience, clear philosophical reasoning such as is presented in Teed Rockwell's excellent book, "Neither Brain Nor Ghost," is in high demand. Rockwell presents a nondualist "behavioral field" alternative to Cartesian materialism with its presumptions of "the mind is the brain." While the brain might seem one of the most likely candidates for situating the mind, recent studies in pain research point out the inadequacies of such thinking, so clearly we need a fuller explanation for what's going on. Rockwell appreciates that getting from a starting point of presuming that the "mind is the brain" to a view of mind being more of a behavioral field engaged in constant interaction with the world requires taking several carefully measured, rational steps, which he carefully provides. Rockwell's writing is entertaining and engaging as he presents a comprehensive, elegant perspective of a behavioral field conceptualization of mind capable of resolving paradoxes that have plagued dualist theories for years. "Neither Brain Nor Ghost" begins by presenting American philosopher John Dewey's criticisms of Cartesian materialism with remarkable clarity. Readers are encouraged to discover new insights through each chapter regarding the idea of reality being fundamentally an ongoing process whose parts cannot exist independently of the interactions in which they are involved. Added to this emphasis on experiential process is the notion proposed by John Stuart Mills that conditions have every bit as much to do with initiating change as any single so-called "cause." We are not only the products of our environments, but also entangled with them to such a degree that lines of demarcation may have been blocking us from seeing the true degree of interconnectedness that exists in the world. Rockwell's conceptualization of the mind as a "behavioral field" is in keeping with the Dynamic Systems Theory approach that is proving itself to be so efficacious in computer science and artificial intelligence. In Dynamic Systems Theory, patterns are observed that shift between various fluctuating basins of attraction amidst ever-changing processes and experiences. We can thus observe for example, that horses tend toward four different movement patterns at different speeds: walk, trot, canter, and gallop. There are efficiencies at certain speeds depending on environmental conditions, and horses can switch from one to another gracefully. "Neither Brain nor Ghost" truly shines when demonstrating logical arguments and scientific evidence in support of viewing the mind as a behavioral field that fluctuates between and interacting with the brain-body-world. Rockwell does an outstanding job of presenting convincing arguments for why the borders of mental embodiment do not belong at the skin, let alone our brains. This book is highly recommended for anyone working in the field of consciousness interested in gaining a clear philosophical picture of mind as behavioral field. "Neither Brain Nor Ghost" is as informative as a college textbook, yet as entertaining to read as any New York Times best-seller, and it's guaranteed to provide you with an entirely fresh new view of the mind in general, and your mind in particular. Highly recommended!